Everything is getting smarter, including your toothbrush. Colgate announced today the release of the new $99.95 Colgate Smart Electronic Toothbrush E1, which not only monitors brushing but is integrated with Apple ResearchKit so that the dental hygiene company can "anticipate the future of oral care." The Colgate Smart Electronic Toothbrush E1 was designed with the help of dentists and features real-time sensors and artificial intelligence algorithms to make sure that 16 different zones of the mouth are being effectively brushed. The Colgate Connect app will ask for permission to collect anonymized data through Apple ResearchKit, and it connects through Bluetooth to an iPhone or iPad. The app has a 3D brushing coach, providing a custom oral care routine for the user and encouraging better brushing habits. The toothbrush was designed in collaboration with Kolibree, which on Monday released the Kolibree Magik - a smart toothbrush for kids that turns toothbrushing into an AR game. 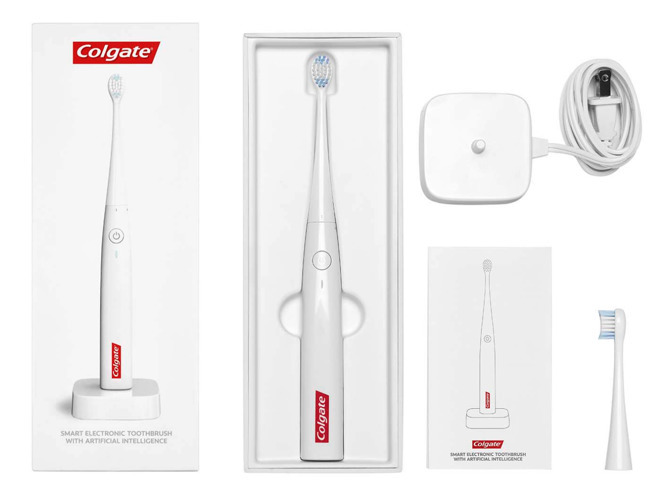 Although the Colgate Smart Electronic Toothbrush E1 hasn't appeared on Apple.com as of publication time, availability is expected today both online and at select Apple Stores.